As a warning, there aren't going to be many pictures is this post, it's really more of a story. Well this twig and the ripples kept me occupied and fascinated for a long time. 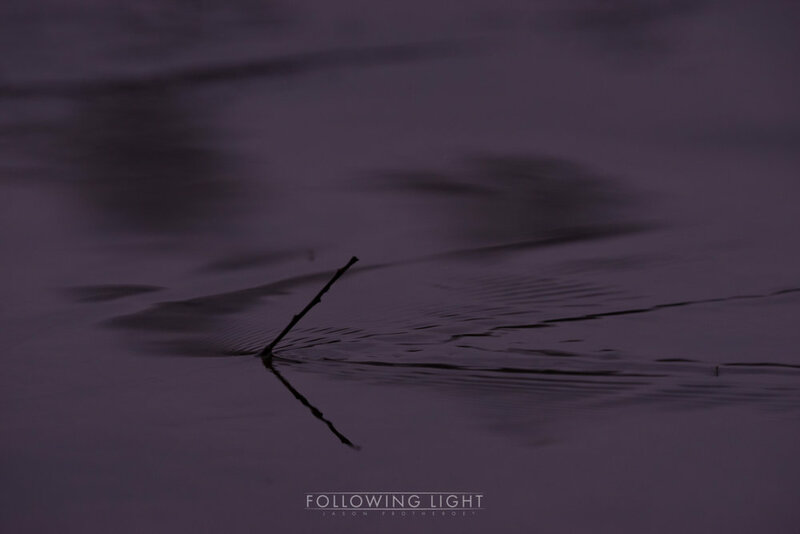 After being busy with other things and more to the point, de-motivated for a couple of weeks, this tiny twig and the time I spent trying to capture this image brought me back. The subject and composition is in itself very simple, but the execution of it wasn't as easy. I took a lot of shots before I managed to get the light right and catch the moment without too much movement. The first problem was contortion. Getting the tripod into a position wasn't too much of a problem. Most of it was underwater, which made it a little harder to adjust the legs to get the height and stability in the flow of the river. I had to do it all again though as I was using a long lens and had placed it too close to the subject to be able to focus on it. The main obstacle here was me, getting myself into a position so that I could see through the view finder without being submerged in the river. I also had to be able to adjust the setting while looking through too. So after moving the tripod again, I found a position that was good for both of us! After the kerfuffle of getting everything into position, I settled down to get the image. I say settled, but what I actually did was precariously balance myself on the edge of a rock so that my hands could reach the camera and my eye the viewfinder. It's interesting what we consider as comfortable when trying to get an image into the camera. What is not that obvious from the image, is that the twig is only a few centimetres long. The river is quite shallow at the place where I took the picture, so the water moves quickly, this meant that the twig was vibrating very fast quickly. I worked with the shutter speed, but even at 1/8000 sec there was still traces of the vibration in the twig. Well at least I thought that there were and with that speed I was struggling with the amount of light getting to the sensor. I didn't want to adjust the aperture any further as it would have effected the depth of field and focus stacking wasn't an option due to the amount of movement in the subject. So it was going to have to be trial and error which as it turns out was a good move for me and exactly what I needed. These are some of the shots and the settings that I used. I'm not sure what caused the purple hue to the shots, I wasn't using a filter. I need to look into it a little more, but I think that it's connected to the shutter speed. The others I converted to black and white before putting them in the blog entry and I changed the hue on the last image to bring out the blues and give a watery feel. On a side note I seem to be making a move towards a 1:1 format. I'm not sure where this is going yet, but I quite like it.